Sand sculpting professionally since 1986, The Sand Sculpture Company has builta reputation of creating beautiful sculptures and sandcastles that awe clients and spectators of all ages creating a unique experience for all to enjoy. Our artists are pioneers of the art of sandcastle building and well known for their creativeness, originality and ability to generate considerable media publicity. To date, The Sand Sculpture Company has literally built hundreds of sculptures across the United States, Asia, Australia, Africa, Canada, Europe, the Middle East, New Zealand, and the Caribbean. The Sand Sculpture Company is headed by Ted Siebert who began sculpting at competitions on the beaches of the Pacific Northwest, under the team Totally in Sand. Since then, Ted and histeammates have participated and won titles in nearly every major sand sculpting event nationwide including: World, National, U.S. and Canadian Championships. Along with competitions came a desire to set world records in sandcastling. 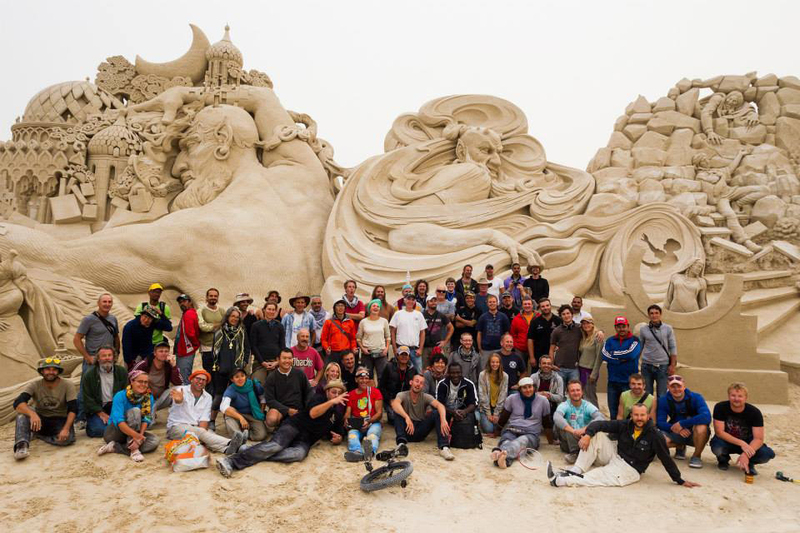 The Sand Sculpture Company artisans have set a total of 8 Guinness World Records, as duly noted by Guinness World Records; an accomplishment no other sand groups can lay claim to. Their last record set the tallest sandcastle at 45.85'. These records are a challenge of engineering, planning, sculpting ability and determination. The Sand Sculpture Company consistently generates a considerable about of media publicity. Some of our most notable publicity has come by way of Associated Press, UPI, nationally syndicated television shows, and national media (including Good Morning America, USA Today, CNN, Weather Channel, Front Runners, Real People, A&E Biography, Travel Channel, Wild Chicago, Smithsonian Magazine, Chicago Tribune, New York Times, Wall Street Journal, Redbook, Parent Magazine, Time Magazine). On every project - local newspapers, television newscasts and local television programs run stories and photos of the sculpting event. In cooperation with Optical Data, The Sand Sculpture Company has produced education videos, which are distributed nationwide, for second and fourth grade math students. 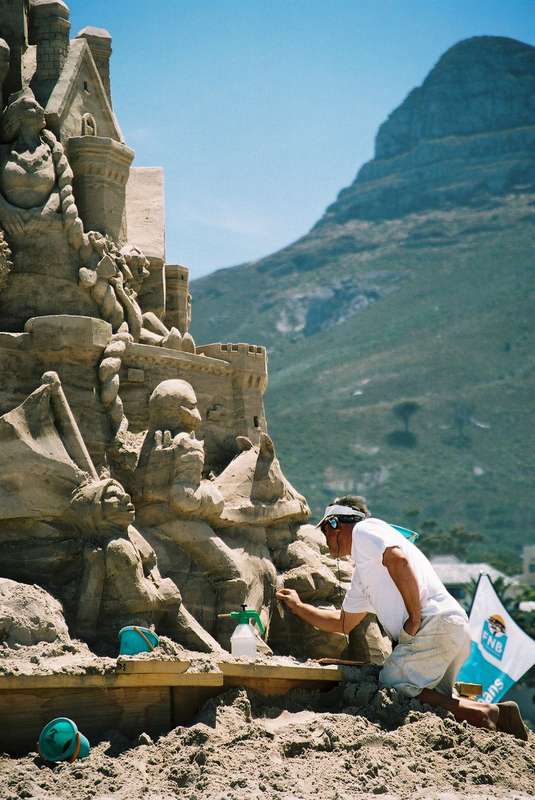 The Sand Sculpture Company artisans participated in the first reality television show on sandsculpting, Sand Blasters - first and second season. There's even was a trivia question on the TV' game show Jeopardy about one of Totally In Sand's World Records. An artist by background and training, Ted discovered that sand sculpting is the ideal combination of art and sport; and a pioneer to commercial sand castles. As co-captain of the competitive team Totally in Sand, he has helped set eight world records, duly notedby Guinness World Records. He is a World Champion, North American Champion, Canadian Champion, and holds titles as U.S. National and Canadian National Champion. Ted is the author of the acclaimed The Art of Sandcastling and the Sandcastle in a Box. Ted has been recognized in the book, The Sculpture Reference, as one of 288 leading contemporary living sculptors. Ted has also taught sculpture at Savannah College of Art and Design. Along with sand, Ted sculpts in wood, clay, and is a fine art oil painter. A graduate from the University of Washington with a degree in Creative Writing, Ted has published several titles as an illustrator. A native of the Northwest, Ted now resides in the Chicago area with his wife Laura and children Danielle, Nicolas, and Gus.